Save for the six-year stint I had in my middle school and high school band, I never listened to any classical music. The closest I get to listening to any type of instrumental music now is the occasional jazz playlist that I pull up when I’m brooding about the miseries of life, but that’s about it. That explains why I didn’t have any expectations about Kronos when I got a ticket to their concert. All I knew about the Kronos Quartet was that their visit was extremely unusual — they’re world-class performers, and yet here they are performing in an intimate, two-hundred seat theater for free. Watching a string quartet isn’t something I would usually think about doing, but I’m learning never to say no to a performance at the Arts Center. I attended the opening performance on Wednesday, September 16 and when I sat down in the Black Box Theater, I marveled at the dramatic transformation in the space: the last time I was there was for Theater Mitu’s production of Hamlet. As people slowly trickled into the theater, I browsed the program to see if any pieces would be familiar to me. None were, just as I expected. What I wasn’t expecting, though, was just how darn popular these guys were: according to the program, all the compositions they played that night were either written exclusively for them, or at least arranged to suit their quartet. After the lights dimmed down and Bill Bragin finished his customary speech, the concert began…except not in a way that I expected. Sunny Yang, the cellist, emerged from the back of the room, making her way towards the stage, where she played alone — but not quite. The other three members of the quartet (David Harrington, John Sherba, and Hank Dutt respectively) were playing outside, connecting music and space in a way I never really experienced. It was so simple. You heard them, but you didn’t see them. Despite its simplicity, however, this effect set the scene for the rest of the performance: the spotlight was clearly on the music, and the musicians were secondary. Bill Bragin’s introduction revealed that the set list for each performance wasn’t going to be the same. The performance I went to was entitled “Good Medicine,” with the music predominantly coming from Central Asia and the Middle East. 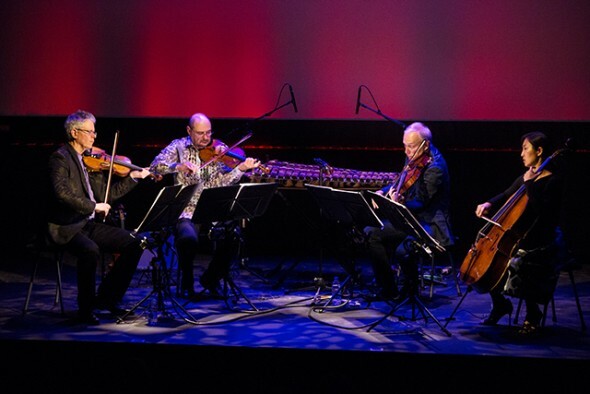 If it hadn’t been clear to me that Kronos wasn’t just any string quartet, it became clear as soon as they started playing: rather than opting for classic pieces by dead white composers (dead white men seem to build the canon in almost any aspect of art), they played music from composers they worked with specifically to create that piece. The best part of the set was the world premiere of a piece by Fodé Lassana Diabaté, with the Malian composer himself accompanying the quartet on his balafon. Quick aside — imagine the balafon as a kind of wooden xylophone, except much bigger than the plastic ones you used to play with as a kid. I know, I didn’t know those existed either … at least not until I attended this concert. Like I said: Kronos isn’t your grandmother’s string quartet. The only word that kept coming back to me as I listened to that piece was joy: rather than trying to find an intellectual reaction that I could later write about, all I had was a gut feeling. I couldn’t think of anything to say — all I could focus on was how happy the music sounded. One of my favorite things to do is to ask people what they are most passionate about. Seeing their eyes light up and their hands start getting into a frenzy as they try to explain what their next research project/installment piece/novella-film-painting is about is a beautiful thing. That’s what struck me the most about watching Kronos play; they were so engulfed into the music that their bodies swayed with every beat and their eyebrows wrinkled in pure concentration. Watching them gave me flashbacks to my band professor, who got so into his conducting that pools of sweat would start to gather on his forehead and you would think that he was directing the New York Philharmonic rather than a bunch of teenagers. After Kronos stood up for their final bow — after coming back for an encore performance of a fun, poppy Egyptian tango — I realized that I’ve seen them somewhere before. I saw them a few days back, in an elevator in the Campus Center, as I was making my way to the library to finish the homework I was supposed to have finished. I remember some fragments of conversation to do with some kind of listening event with some kind of crowd, but I didn’t make the connection that it was Kronos in the elevator with me. After seeing them perform, however, all I could think about was that brief moment in the elevator. They were so unassuming, I didn’t know any better, and yet there they were right in front of me. Little did I know that these same people would eventually come together in a performance that would make me shift my understanding of what it means to make music, all without saying a word.